Drying oils, mediums, varnishes and solvents are the ideal match for your oil paints and offer artists a way to control, adjust and enhance the working properties of their oil colours as well as protect their final pieces. You are free to make infinite adjustments to your colour to suit your creative vision. Experimenting with different mediums and exploring their benefits will put a whole new world of creative possibilites at your fingertips! Our range of oil mediums, solvents and varnishes can be used to open up a range of new oil painting techniques and effects for you to experiment with. Selecting your oil mediums is a process as unique as selecting the colours to include on your palette - it will largely depend on the methods you use to paint and the effects you would like to achieve. Mediums can also be used to rescue paintings whose colours have sunk over time; you can find out more about this and other oil painting techniques on our Oil Painting Techniques page. You can discover more about mediums below; this information will be useful in helping determine which mediums are the ideal match for your painting practice. In general there are five different types of oil colour additive you will encounter if you are just beginning oil painting, these are; oil mediums, drying oils, solvents, varnishes and specially formulated water mixable mediums. The mediums you choose to work with will depend largely on your painting style, but the chart below can be used as a rough guide to quickly work out which medium may be best for you. The names are taken from the Winsor & Newton oil medium range, but you may find similarly named products across ranges. You can find more detailed information about the different oil mediums that we stock by following the links further down the page. Having a few essential oil mediums in your painting arsenal can greatly expand your painting practice. With some carefully selected oils, mediums and solvents under your belt you will have the freedom to alter drying time, add texture, create transparency and prevent overthinning. Learning the difference between the types of mediums on offer can help you get a greater understanding of the mediums you may require. Links to more detailed information about mediums from specific manufacturers can be found in the further reading section below. A Drying Oil refers to the oil used to bind an paint that dries to a hard, protective film to protect the oil colour layer beneath. Traditionally, Linseed oil was used in the formulation of most oil paints, but the introduction of quick drying Alkyd resins has seen some traditional oils replaced with these speedy drying alternatives. Additional drying oils are available that can be added to your oil colour to adjust colour, increase gloss or create transparency. Specific oils have been developed for use with pale colours, these non-yellowing oils are Safflower and Poppy Oil. Oil mediums are ready made mixtures of particularly suitable linseed oils with solvents .Modern resins called alkyds are used to make fast drying mediums for oil painting. These are extremely popular because they generally halve the drying times of the colours. Liquin is in fact the most popular oil painting medium. It improves flow and transparency and is less glossy than oil. 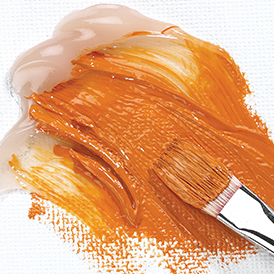 Thinners are used to dilute the colour and clean brushes and palettes after painting. The same solvents can be used with all types of oil colour, with one exception. 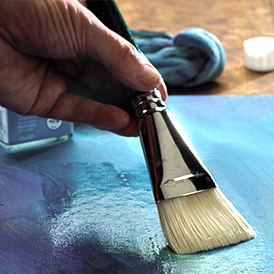 Water mixable oils are intended for use with water to avoid the need for traditional solvents. Turpentine is the traditional solvent, with a characteristic smell. It maintains the oiliness of the colour in use. White spirit (mineral spirits) and Sansodor are petroleum distillates. The first petroleum distillates were thought only to be good enough to clean brushes. This is no longer true of solvents supplied as artists' quality. White spirit makes a watery mixture with the colour and evaporates more quickly. Sansodor performs like turpentine but has a low odour and is the least hazardous of the solvents. All solvents should be used in a well ventilated room. 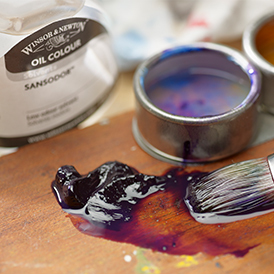 Make sure you use artists' quality solvents. Solvents sold in hardware stores are not expected to be used in fine art and yellowing or non - drying can result. It is important to avoid overthinning when using solvents. Solvents thin the oil colour by diluting the linseed oil. If too much is used, there will be insufficient oil remaining to bind the pigment. A matt or uneven finish will appear on the painting and the work will be susceptible to scuffing and damage. Overthinning is avoided by the use of mediums in addition to solvents. Varnishes are used to protect finished paintings. For fine art usage, picture varnishes should be removable so that the painting can be cleaned in the future. Winsor's varnishes are labelled “gloss” or “matt” and vary according to the different resins used. Oil paintings must be thoroughly dry prior to varnishing. A thin painting will be dry in about 6 months, an impasto will take longer. 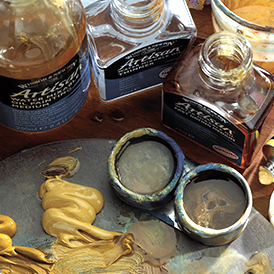 Water mixable mediums are available for use with Artisan Water Mixable Oil Colours. These dedicated mediums ensure that all the traditional oil colour techniques can be achieved without the use of turpentine or white spirit (mineral spirits). All the conventional mediums can be mixed. However, the structure of the painting is under less stress in the long term if mixtures are avoided. We recommend Water Mixable Mediums to be used exclusively with Artisan colours in order to benefit from the use of water instead of solvents. Picture varnishes are not recommended as constituent parts of mediums because of their resoluble nature. Neither should they be used as intermediate layers in oil paintings. You can find out more about the different methods you can use your oil mediums with by visiting our Oil Painting Techniques page. 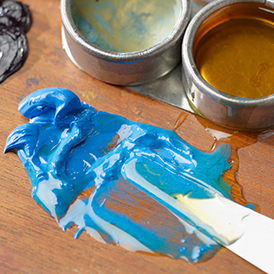 > To find out more about Winsor & Newton Traditional Oil Mediums please click the blue link. > To find out more about Winsor & Newton Artisan Water Mixable Oil Mediums please click the blue link. > To find out more about Cobra Artists' Water Mixable Oil Mediums please click the blue link.